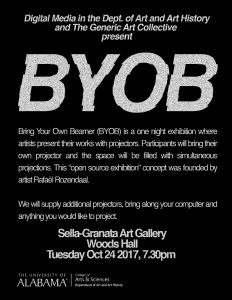 The Digital Media area of the UA Department of Art and Art History and The Generic Art Collective present “Bring Your Own Beamer (BYOB)” on Tuesday, October 24 at 7:30 p.m. in the Sella-Granata Art Gallery in Woods Hall. If you don’t have a projector, come anyway. Bring your computer and anything you want to project. Digital Media is a studio concentration in the undergraduate program of The University of Alabama’s Department of Art and Art History that focuses on new media and digital art. Courses explore digital media as the primary tool, medium and an environment for art and design. For more information, go to http://art.ua.edu/academics/undergraduate-programs/digital-media/.